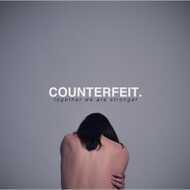 Together We Are Stronger is the debut album from Counterfeit. The 10-track album was produced by Thomas Mitchener (Frank Carter & The Rattlesnakes, Dead!) and recorded at Broadfields Studio. It'ss full of punk-rock flair and showcases front-man Jamie Campbell Bower’s raw and honest vocals.